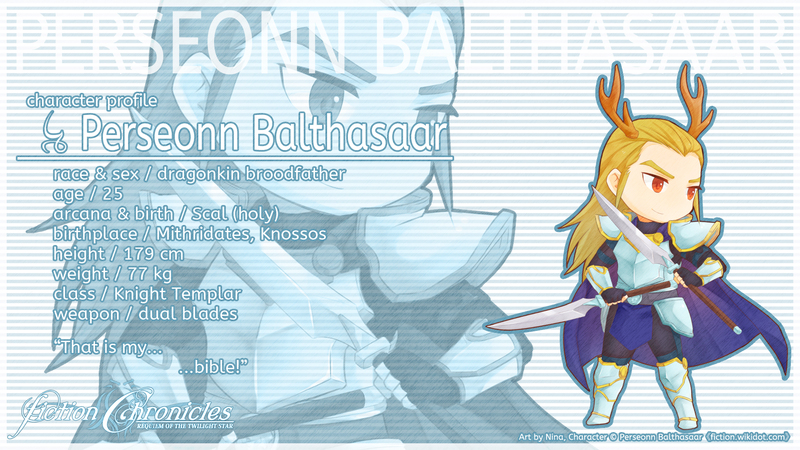 Perseonn Balthasaar is a dragonkin Knight Templar from Mithridates, Knossos. He is the son of Danae and Zeus. In a certain town, Perseonn met Renn on the local pub. He remarked Renn's peculiar way of thinking and decided to accompany him to Aistear Creidimh. On their journey, they found a pirate named Kirsche, who was stranded on a beach. They saved her and nursed her back to health, in which she also decided to follow them. He has orange eyes and long slicked back old gold hair. He is very idealistic to the Old Code of the Church which at times puts him in trouble even when his intention was good. He chose to be a templar because he likes to deliver sermons. Different from other preachers, he delivers his sermon to children, believing that children's minds are easier to work with. To help his job, he has a pop-up bible. Although the bible artwork is cute, it is still graphic in depicting violence. Although he prefers morally correct ways, he is not above having adult books on his bag. 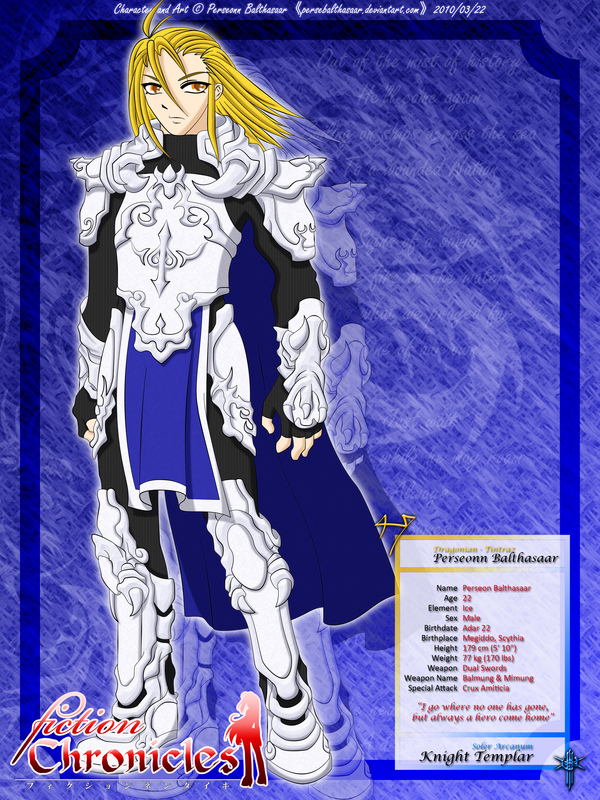 In battle, Perseonn wields dual blades and is proficient in physical and magical attacks, as well as healing. He always carries enough sacramental bread and wine. While the party does not quite like the taste, it is better than Rudolph's dishes. When idling in a town, Perseonn will visit the Hellenia church to get his payment. His journey expresses his inner truth, where he needs to express feelings based on what he experiences in his heart rather than what would be socially expected or demanded of him. Perseonn's name was modified from the Greek demigod, Perseus. His last name is artifact name that was adapted from the Babylonian king, Belshazzar. He used to have a baptized name, "Thanatos", but was dropped because how ridiculous it sounds. 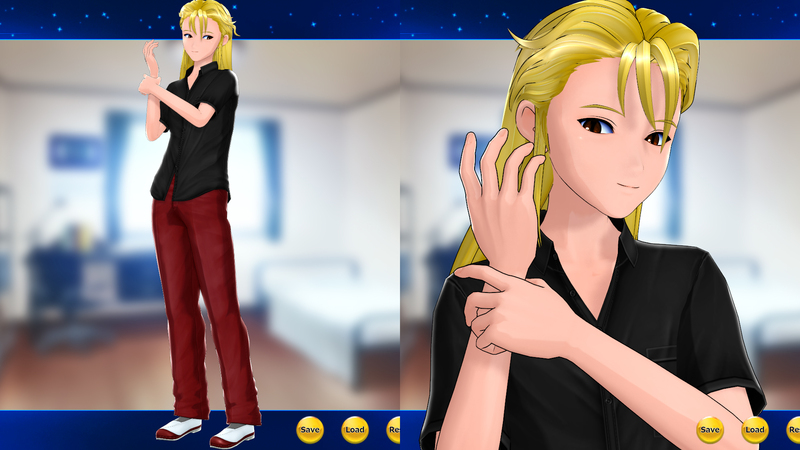 He is 25 years old during the event of Requiem of the Twilight Star, 179 cm tall and weighs 77 kg. The first design of Perseonn. He previously had Red clothes and Gold armor, but I changed his affinity to Ice and changed his armor color as well. He looks better now and I never looked back. I wanted to add more Blue accent to his armor to resemble Kamen Rider Ixa, but their aren't enough color slots. The concept is similar to the Knight of the Old Code, but with a different color. His color scheme is #211, Knight of Honor. 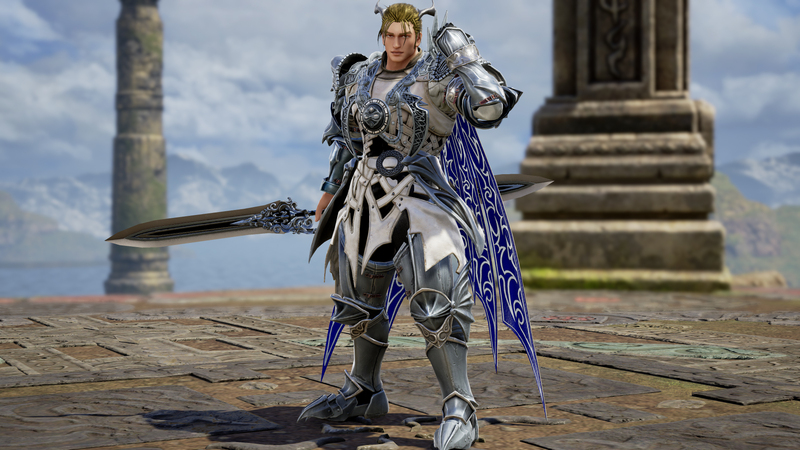 A very light version of his armor. It's missing its Bluish Silver armor, but unfortunately, that color does not work in BD. Classic Knight of the Old Code. I'm happy now he can have his artwork-accurate hairstyle. This is his outfit when he's using his racial skill, Power of the Dragon Father. Essentially he strips down to his underwear. The skill greatly increases his strength, but also greatly decreases his defense. Young Perseonn during the events of Secret Promise. He does not have Balmung during this time, hence the single-sword style. His outfit is missing any sort of cross, which is unfortunate due to the sticker limit. 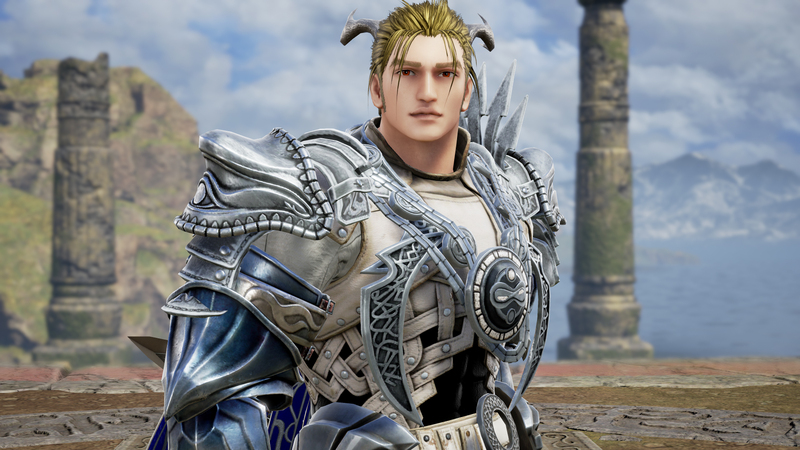 His voice is changed to Young Knight and face changed to represent his youth. Later Perseonn during his ending, where he will become a farmer. He gave up his church career to live peacefully with the one he made promise with. This is the only incarnation to feature Perseonn's post-cardinal outfit. The blonde hair color is too bright, so I settled with light brown instead. Also, I like this hairstyle. This is a more formal outfit compared to his 7E. His farmer attire during the end. I have an issue with him holding his weapon that way: it suggest that he is ready to attack, rather than laid-back.